I had a great time in Hanoi, mainly due to making some very nice local friends. On my last day there, we all went together on a day trip. I had agreed on it without even checking where we were going. I was there for the good time but I got to enjoy a beautiful boat ride in Trang An. Trang An is like Halong Bay on the land. 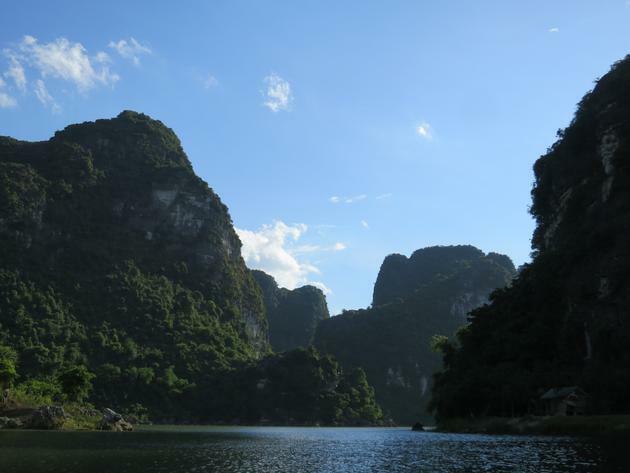 The region is made of karst mountains with rivers flowing in between. The two hour boat ride goes along the rivers, going from rivers to rivers by using underground tunnels! The landscape is amazing and the blue sky made it look even better. Riding on the small boats you get the feeling of being an explorer with his expedition team (or maybe I have to much imagination). The day trip usually combines the boat ride with the visit of the Bai Dinh Pagoda which is not that interesting but worth it just for the boat ride.